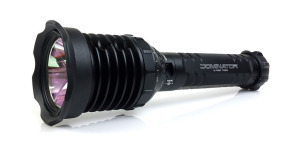 SureFire has introduced three new attachments – the F04-A Diffuser, F05-A Red Filter, and F06-A Blue Filter – made to accommodate the 1.125″ bezel used on recent flashlights and weapon lights. 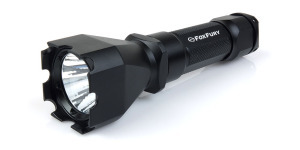 Designed to slip over the bezel and remain in place using a friction fit, these new attachments allow users to modify the standard beam of their flashlight for specific tasks. When performing close tasks, the F04-A Diffuser provides a white, evenly diffused beam. 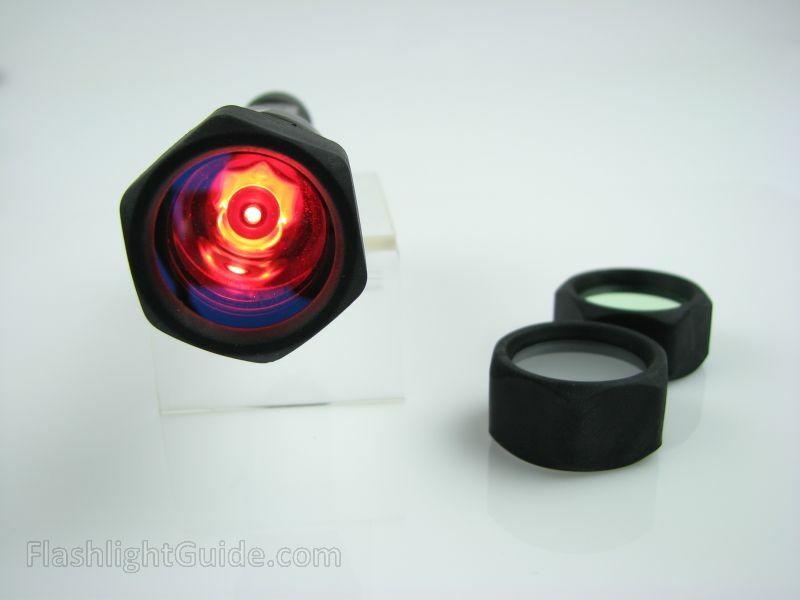 When preservation of night vision is a priority, the F05-A Red Filter produces a beam of red light that will not degrade night vision as much as white light. As some animals see poorly in the red spectrum this is a useful filter for hunters moving about in pre-dawn hours. The F06-A is a blue filter designed to produce a beam of blue light which is useful for hunters tracking wounded game in the dark. 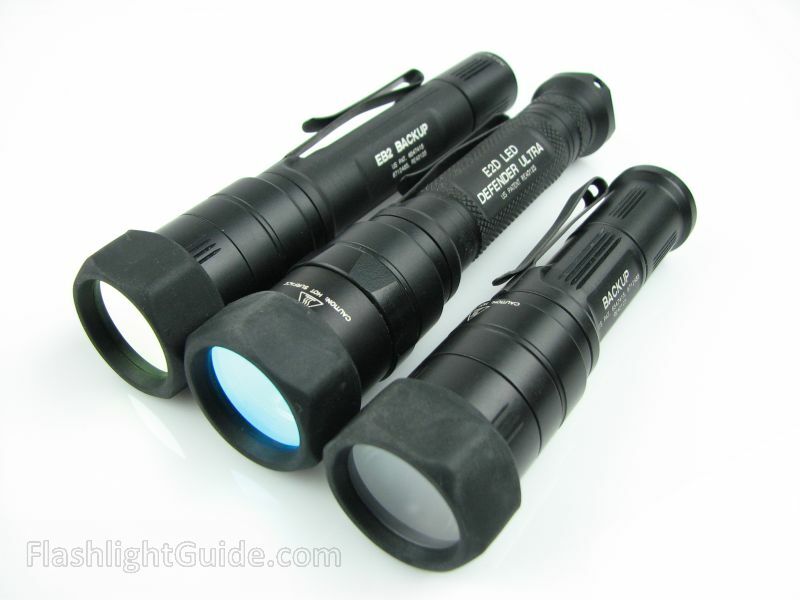 All three attachments reduce the intensity of light output making them useful for close-range, non-tactical applications such as map reading. Aside from their larger size and price tag, these newest attachments are essentially the same as their 1″ predecessors, the F04, F05, and F06. MSRP for the F04-A, F05-A, and F06-A is currently $30.00 each but hopefully we will see lower retail prices once dealers have them in stock. The following photos show the filters along with a variety of lights including the EB1 Backup, EB2 Backup, E2D LED Defender Ultra, and the E1L-A, E2L-A, and E2LAA-A Outdoorsman lights. (Click on thumbnail images to launch slide show). 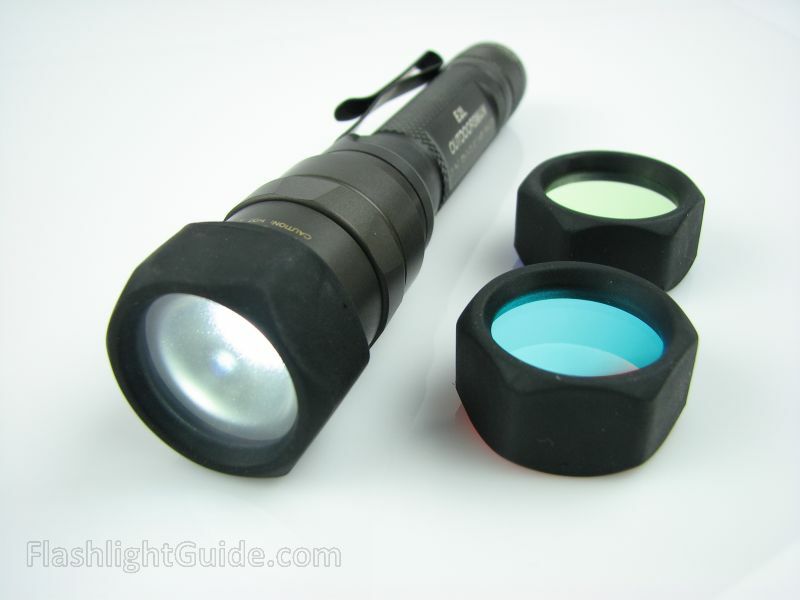 The following slides show beamshots of a variety of previously reviewed lights both with and without the use of the filters. 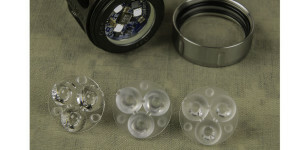 The beamshots can be compared across the full width of the image using the slider, while additional images can be accessed using the navigation buttons in the bottom-right corner. NOTE: Exposure and shutter speed were set based upon the normal output of the lights. The photos under represent the spill beam with the blue and red filters. Based on a simple and proven design, the filters and diffuser can be installed or removed in seconds allowing users to configure their light based upon their needs. The F04-A Diffuser produced an extremely smooth and even beam which provides excellent contrast. 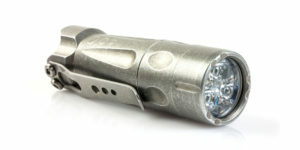 When used with the lower powered Outdoorsman lights the output is perfect for close-in tasks and general area illumination. 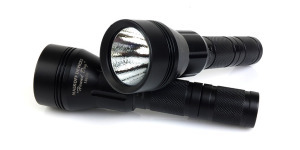 With higher powered lights such as the EB1 and EB2 it produces an absolute “wall of light” that is still capable of reaching well over 100 feet with the EB2. As expected, the F05-A Red Filter attenuated output the most and is the most effective for preserving night adapted vision. I also found the F06-A Blue Filter to be surprisingly effective, providing more area illumination than the F05-A but still preserving a fair amount of night adapted vision. With both colored filters the beam was reasonably free of artifacts although the color is not quite as vibrant as with the older F05 and F06 filters. When testing the red and blue filters, I did notice the outermost portion of the spill beam shifts from its primary color. This portion of the spill beam is very faint and and I didn’t even notice it until I was testing with one of the higher-powered lights but, once I knew it was there, it was easy enough to spot when using each of the lights. The F05-A Red Filter shifts from red to orange and finally yellow at the outer edge while the F06-A Blue Filter shifts from blue to purple at the very edge. I do not know whether this is be design or for some other reason but, aside from being odd, it had no adverse affect on my use of the filters. I have been waiting for these attachments to become available ever since the introduction of the new Outdoorsman lights and I am very pleased with them so far. Each has already found a home on my E1L-A (F04-A), E2L-A (F05-A), and E2LAA-A (F06-A). I was most impressed by the diffuser when used with the EB2 Backup and I have a feeling it may be getting its own F04-A in the near future. What are your typical uses for colored filters and diffusers? Share these, along with any other thoughts or questions in the comment section below! 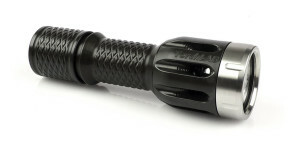 Additional information about the F04-A, F05-A, and F06-A can be found on the SureFire website. 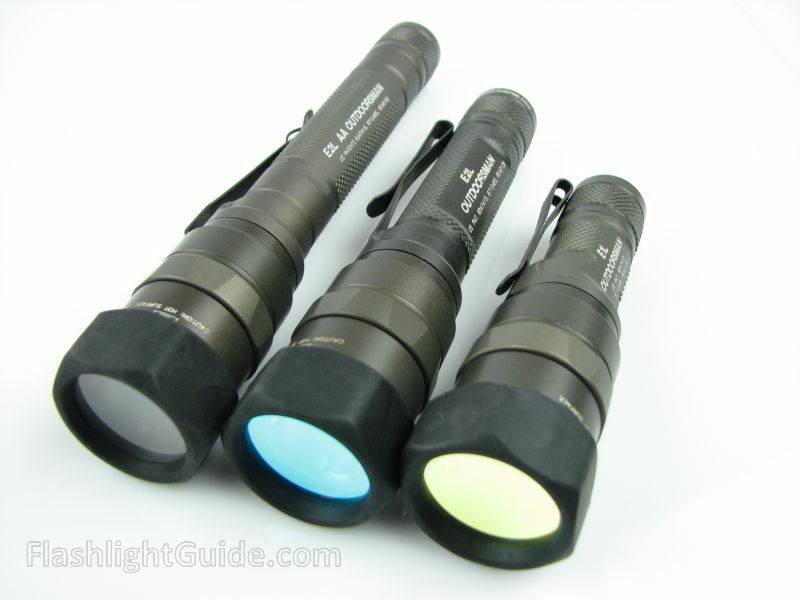 Posted in Flashlight Accessories, Flashlight Reviews, SureFire Reviews and tagged Flashlight Accessories, Surefire. 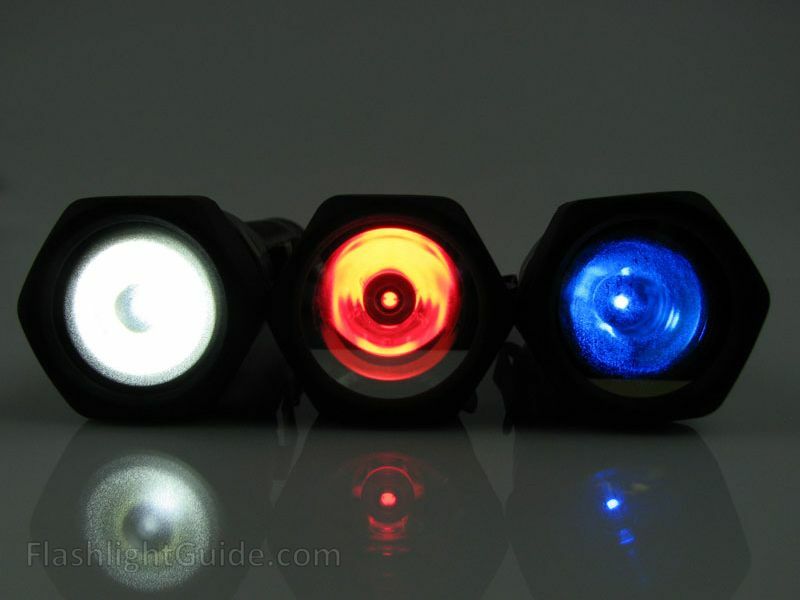 How many lumens can be expected to make it through the diffuser? Will the diffuser lower the output in a way similar to the red and blue filters, or is the loss in output negligible? Based upon a very non-scientific test with the EB2, I would say about 85% of the light’s output makes it through the F04-A diffuser. The diffuser is not intended to block any light other than the normal optical losses you receive any time you place something in front of the LED. Filters are totally different as they block all light other than the specific wavelength they are designed to pass (either red or blue). This results in all of the white light being blocked and output is greatly reduced when the F05-A and F06-A are used. You can see it really well in the side-by-side photos, but I have really noticed that the colored filters do not act as diffusers and the beam profile is nearly unchanged. The hotspot remains intact and only the color of the output is changed. I am also a huge fan of diffusers. I really like the FM54 which is the aluminum flip to the side version. I wonder if SF will release a 1.125″ version for the newer lights. I don’t think the FM54 was very popular because of the super high price tag. I agree with you about the filters. They have very little, if any, effect on the beam pattern. 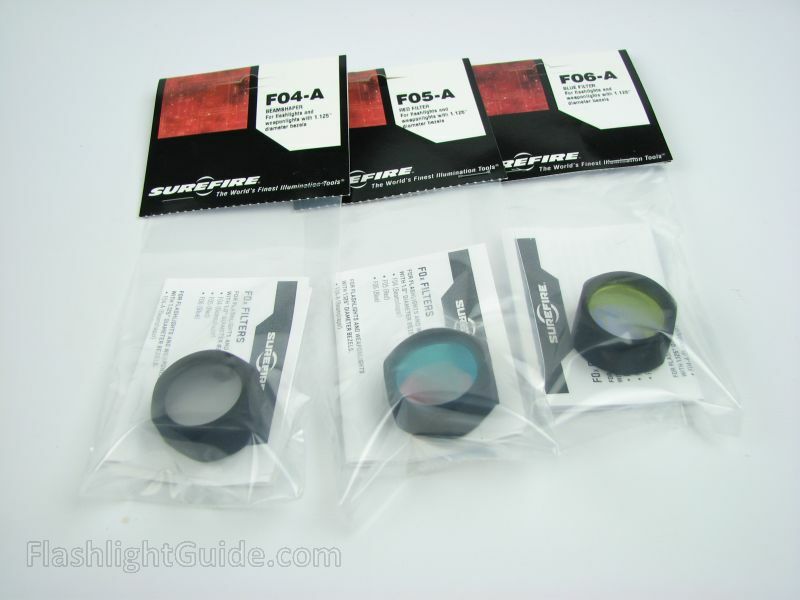 SureFire had plans to introduce a flip-up filter with interchangeable lenses, similar to the FM54, but I haven’t heard anything about it for quite a while. Thanks for stopping by!